Welcome to our webpage ! Shaolin Dragons Kung-Fu School is aimed at providing a stable and comfortable environment for the advancement of the dying ancient traditional styles of Samurai and Shaolin techniques. We teach our students that violence is not the way to solve their problems and that the art taught is not to be misused or abused in any form or fashion and must always be respected. Discipline and self-control are essential elements of the training in this ancient art of the Shaolin. We invite you to take a minute to explore our pages and also to visit us at the Foundation School, Christ Church on Wednesday and Friday afternoons between 3:00p.m. and 5:00p.m. 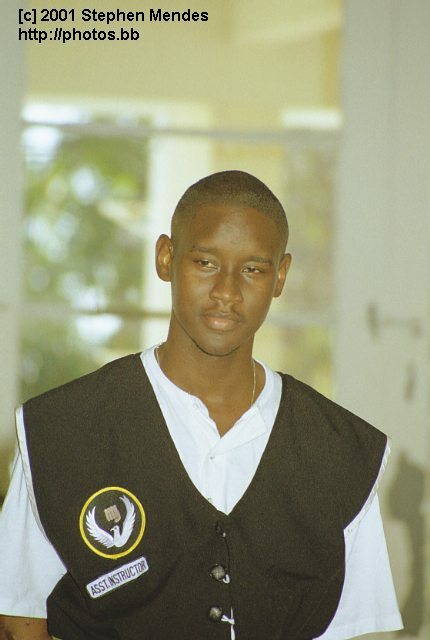 On returning to Barbados, and while attending Foundation School, she started the Shaolin Dragons Kung-Fu School, on October 3rd, 1993, assuming the title Young Master Chi.... It seemed like an arduous task, but surprisingly thirteen eager students attended the first days training. During the past eight years the club's members have risen and club fees remained at U.S. two dollars and fifty cents for registration. It is a non-profit organisation in which all funds received are then given back entirely to the club. This means that the instructors are not paid. The sensei along with her most senior ranked try to operate and run the school as efficiently and effectively as possible. Our past achievements, obtained through hard work and dedication, include the capturing of 6 silver medals and 8 bronze obtained at various tournaments by participating members of the school. We are currently working to expand the age range of our members to include pre-teens and mature adults. We are looking for sponsors to aid us in the purchasing of needed equipment. If you would like to send us a donation for this worthy cause, please e-mail below. Space donated by the Barbados Photo Gallery.... visit it today !